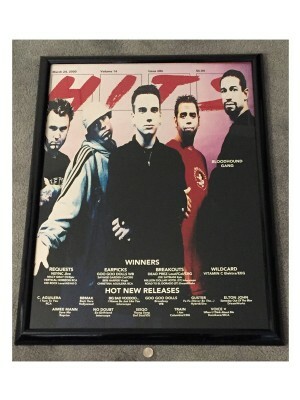 Large (measures approximately 25.25" x 32.25") framed enlargement of the cover of HITS magazine featuring the Bloodhound Gang. A few small scratches on the plexiglass, pretty sure this is one-of-a-kind. Oversized, overweight item: interested buy..
Super rare promotional plaque (it's a lacquered wood image) that once hung on some music executive's office wall. Reproduction of an ad that would've run in a trade magazine, highlighting the release of "Along Comes Mary." Measures approximately..
Set of 5 LP sleeves from "Hard-Off" that were damaged in shipping. Give them as gifts! Wallpaper a room! Note: main photo is indicative of type of damage (bending, creasing, etc.) but actual sleeves vary from one to the other. Secondary image is what..
Rare promotional item created for the European release of "Hefty Fine." 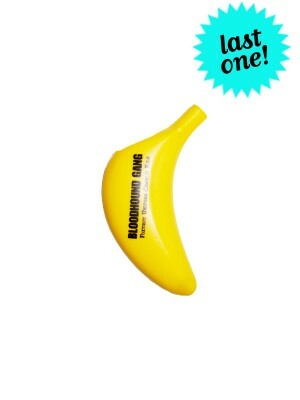 Banana-shaped foam cellphone enclosure (for cell phones circa 2005...), featuring text heralding the new album. Last one! ..
Rare promotional item created around the European release of "Hefty Fine." 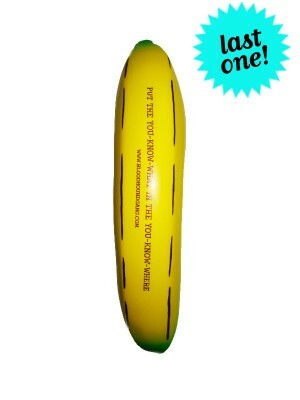 Plastic, banana-themed holder for the average disposable lighter. Imprinted with band info on both sides. Last one! .. Promotional postcard from the release of Hefty Fine. .. Promotional postcard from the release of Hefty Fine. Geffen wouldn't print these, so Jimmy Pop did. 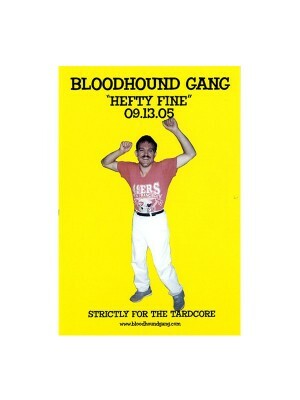 ..
Poster printed for the release of "Hefty Fine"; includes incorrect release date. 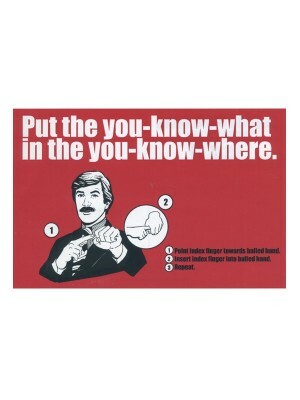 Measures approximately 11"x17". 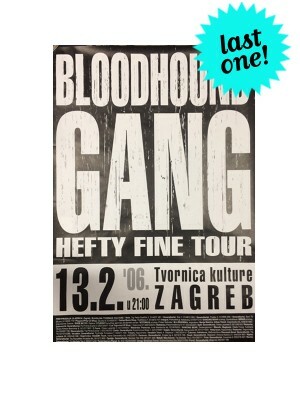 ..
Rare poster from Hefty Fine tour in Zagreb. Measures approximately 26" x 38"; some very minor wear from storage. Ships in a tube, please do NOT combine with other items! .. Promotional copy from the Jimmy Franks Recording Company archives. ..
Rare promotional postcard; front image is a sticker. 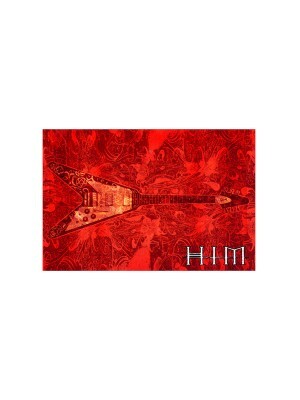 ..
Limited edition gatefold vinyl release of HIM's finest moment. Heavyweight, pink, 2 LP set from the Jimmy Franks Recording Company. .. Promotional poster for HIM's "Razorblade Romance." Measures approximately 11"x17". .. Promotional postcard from the release of "Hooray For Boobies." ..
Compliation CD brought back from Italy by the band. 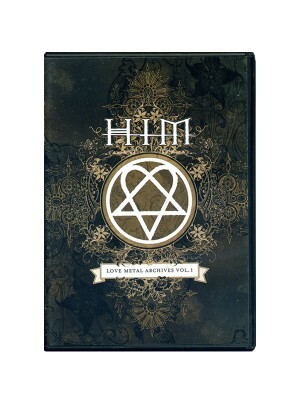 45 tracks on 2 CDs including the Rasmus, Gorillaz, and Bon Jovi. 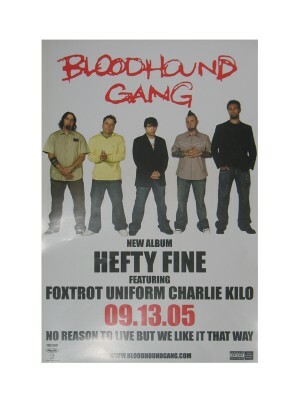 Bloodhound Gang track is "Foxtrot Uniform Charlie Kilo." CD is new, but not shrinkwrapped. 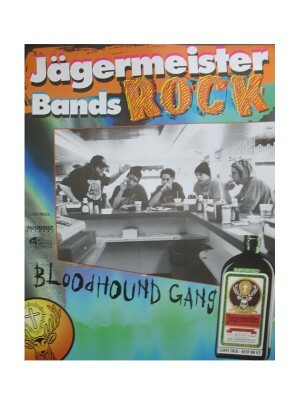 ..
Vintage poster from "Use Your Fingers"-era Bloodhound Gang. Measures approximately 17"x22". IMPORTANT: Large posters (like this one) must be ordered separately from all other items (except other large posters), as they ship ..